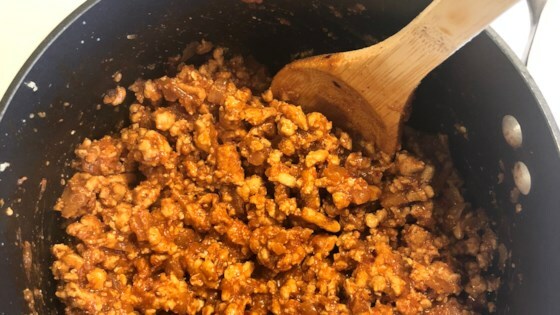 "My son claims this is the best recipe I have come up with for sloppy joes. Serve on hamburger buns and top with cheese." Heat oil in a large skillet over medium heat; cook and stir onion in hot oil until translucent, 5 to 7 minutes. Break ground turkey into small pieces and add to skillet; cook and stir, breaking turkey further into smaller pieces, until completely browned, 7 to 10 minutes. Stir ketchup, vinegar, Worcestershire sauce, Dijon mustard, brown sugar, and chili powder into the turkey; cook at a simmer until hot and thick, about 10 minutes. See how to make a delicious Sloppy Joe with ground turkey! I make this quite often. It is simple and quick on a weeknight and my family loves it. I never add the mustard and sometimes use apple cider vinegar which makes it a little sweeter. Awesome! Great with turkey or beef. I like to chop up a bit of bacon and add it. To die for! No changes to recipe. Was spicy enough for husband and mild enough for me. A different way to use ground turkey. Will make again. Had all the ingredients And made exactly how listed. I do not love turkey or sloppy joes, but this recipe was great. Cut back on the chili powder if you don't like it too spicy.